I've been plugging away at the game, although it's been a period where there isn't too much visual to show for the progress. I've been alternating between creating environments for the different sports, while fixing bugs and adding missing features to the game. And here's an updated look at the title screen of the game, which now looks a bit more professional. Eventually the athlete (and the trick they are doing) in the background will be randomized as well. As usual follow me on twitter (and now also on Instagram) for day-to-day development updates, and sign up for my mailing list if you want to be notified when the game is announced / released. I'm hoping that people will find that what happens in the game makes them laugh, makes them proud, makes them think "WTF"... and so I want people to be able to easily share things that happen. So I've been working on the instant replay system which records your attempt at a trick, and then lets you play it back with lots of controls. 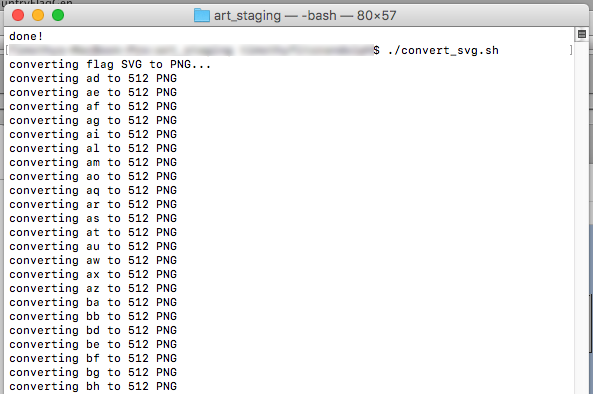 I've now also added built-in animated GIF export to the game. Here's a video of it in action. you hit the "export" button, then select the export range (essentially trimming the clip), and then hit save. It renders out the frames, and saves a GIF to a folder on the desktop. easy! I'll eventually add support for posting your GIFs straight to social media as well. In other recent news, I captured a video of a real-life "layout" on trapeze (that's me, the real "Walaber" BTW), and compared it to the same trick in-game. Pretty dang close, right?!? I've been taking some steps to finally make the user interface of the game fit the overall theme a bit better. I had some temp fonts and ui frame / button images in there for a long time, and now I have a first pass at button and other UI theming, plus I think I've chosen the font for the game as well. Here are some pretty images of the Character Editor screen, one of the most UI-heavy screens, and also a chance to show off how the character customization is coming together. I've noticed that a lot of my games seem to end up with some kind of feature to record gameplay and then play it back again. "Gymnast" had a very robust version of this, and even something like JellyCar 3 recorded your runs in order to have "ghosts" you could race/compete against. 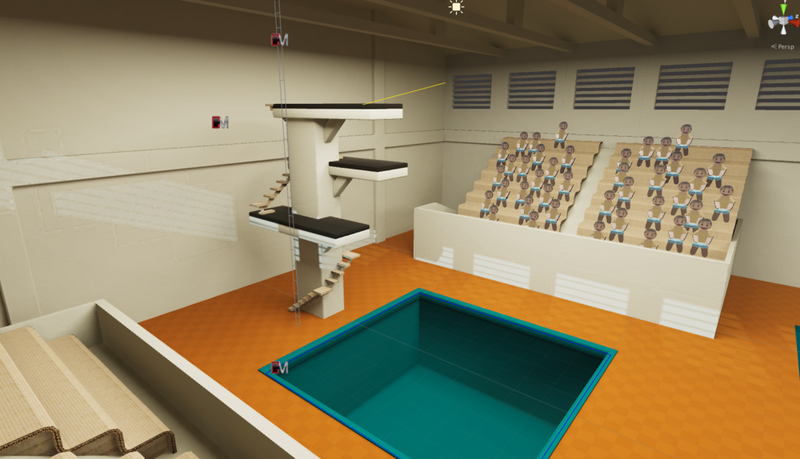 "One More Flip" is going the route of "Gymnast", allowing players to record their gameplay, save it, watch it later from different camera angles, etc. Eventually I hope to have an in-game "export to GIF" feature, perhaps with Twitter integration to tweet replays directly from the game, a-la Fantastic Contraption VR, a feature I loved and wish more games had! As always, for more development updates follow me on Twitter, and sign up for the mailing list if you'd like to be notified when the game releases. I want players to be able to customize their character as much as possible, but generating lots of variations of hairstyles, face shapes, etc can be quite costly. I'm attempting to give a solid number of options without going crazy, hopefully there will be enough that most people are happy with their avatar. An area where I think I found a nice solution is on the actual look of the outfits. I've decided to have a pre-determined outfit for each "sport", which the player can't change-- so the "gymnastics" outfit only has 1 shape, and overall color pattern. However, it has a space on it to display a country flag, and all of the colors of the pattern can be changed dynamically. 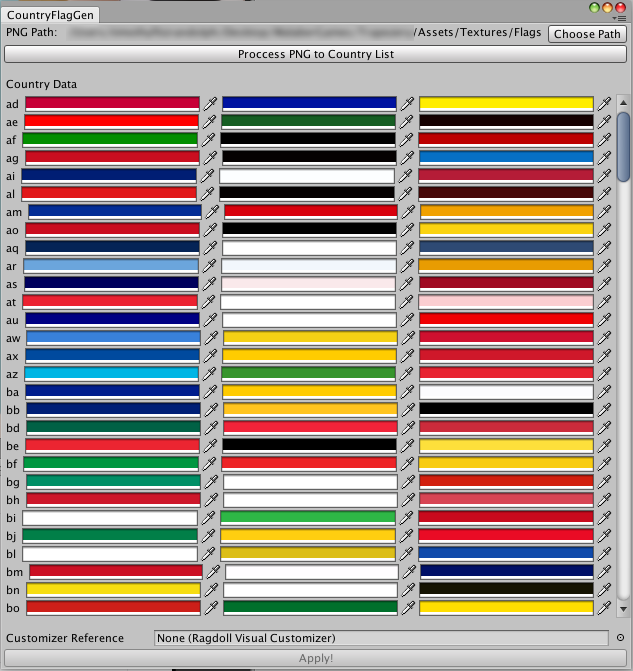 I then found a database of all the country flags in the world, and imported them all, running a script to generate the correct texture format I need, and also extracting the top 3 most used colors in each flag, and set those as the outfit colors to accompany that country flag. I also give you the option to "shuffle" which colors will go where on the outfit, from a total of 6 possible combinations (since there are 3 colors total per outfit). Here is how that looks in the current build: a huge list of country flags you can select, as well as a toggle for the "color scheme" to adjust which colors end up where. As usual follow me on Twitter for more regular "making of" updates, GIFs, and videos, and subscribe to my mailing list to be notified when the game is released. Lately I have been working on a variety of tasks to get an initial playtest-worthy build together of "One More Flip". The biggest task for this is making my first attempt at a tutorial for the game. Although I plan a sequence of levels that slowly teach you the game, I think the controls require a bit more explicit instruction, and so a tutorial is necessary! My first idea involved explaining to the player that Raggie is a physically simulated character (not just some animations), and also that the player provides the timing for Raggie to move through the various poses required to do a given trick. In order to communicate this, I realized that Raggie needed a skeleton. ... and testing it in-game. All of this is in service of the following moment in the tutorial, where I communicate that Raggie has a skeleton (and muscles), but is lacking in the BRAIN department-- hence the need for the player! I'm getting very close to a playable build, and I'm looking forward to doing some testing with friends and family to iterate further on the game, and the tutorial. As usual, if you want to follow along with more frequent development updates, give me a follow on Twitter. Continuing progress on "One More Flip". My focus right now is mostly getting the entire game connected together and playable as a stand-alone experience. For example right now I have to change a setting each time I want to test out a different trick and then run the game. It's about time to start getting feedback from players, so I need a build I can just hand to people and watch them play and take notes about what's confusing, etc. I am close, I already have code for creating a character, and a basic screen for sequencing out tricks and unlocking them as you progress (including annoying player data save/load routines). Here is another video, this time of working on the pose sequence for a "back handspring", which turned out better than I thought, although the timing makes the trick harder than I had anticipated. As usual, follow me on twitter to see more videos and behind-the-scenes development stuff, I post pretty frequently. Also sign up for my mailing list if you want to be notified when the game is available. I've also spent some (perhaps too much) time making the landing mats in the game behave just like I want them to. They are a pretty detailed physics model to simulate a mat that can compress, return its shape, and also deform in a realistic way. The mat is basically several rigid boxes connected together in 2 layers (like an ice-cream sandwich), with springs in-between to push it out to it's target thickness. The pieces don't collide with each other so they can overlap and give good collision response to the player who lands on it. Also since the visual design is now "clay", I need to generate a dynamic mesh for the mat that is beveled (rounded corners) to look more like it's a piece of clay. This was one of the more tricky/tedious custom mesh routines I've ever written, but I'm very happy with the results. It still needs UV coordinates and some clay texture/normal maps, but that will be relatively easy to add. I've also done a lot of invisible work on screen flows, preparing the game for localization, adding support for difficulty modes, etc. After getting the character model I've been in the process of rigging it up and integrating it into the game to see how it will work, etc. The vision is for the player to have choices of many body shapes, skin tones, head shapes, hair styles, etc so that they can customize the character to their liking. The environments will also look like they are made out of clay eventually as well. Here is a first video of the character integrated into the game. Still some visible rigging issues, but it's starting to look pretty good! I'm happy to announce that I'm working on my first commercial game as Walaber Entertainment! It's still very early days, but development is going along well. The game is basically about doing flips! Flips, flips, flips! Across a variety of settings: trapeze, gymnastics, diving, aerial skiing, etc. I'm currently working on the core physics system and some of the gameplay features, I don't have any pretty graphics yet. You can follow my progress every week on Twitter where I'm constantly posting short videos and behind-the-scenes stuff. I don't have a title for the game just yet, nor do I have an expected release date... It'll come out when it's done! If you don't want to miss being notified when it comes out, please sign up for my mailing list! I only mail people when products are released or have major updates. The website for walaber.com is finally up and running again after a long hiatus! I'll be adding in a history page soon to showcase the games I've made previously, but more importantly I've started working on a new project the I'm excited to talk about soon. The plan is for it to be the first commercial walaber game release!